Kristina Barker/Journal staff Jesse Herrington demonstrates one of the exercises he does during a workout while at his home gym on Wednesday, Feb. 3, 2010. Herrington and his wife decided to make a home gym once they moved outside of town, East of Tilford. 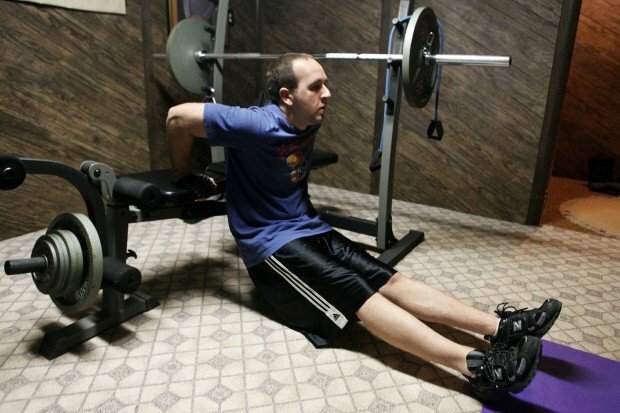 Kristina Barker/Journal staff Jesse Herrington demonstrates one of the exercises he does during a workout at his home on Wednesday, Feb. , 2010. Herrington and his wife bought a used weight bench and were given a used elliptical machine from a family member. The Herrington's have come up with some ways to do exercises they did at the gym by improvising with that they have at home. Kristina Barker/Journal staff Jesse Herrington demonstrates some of the workouts that he does in his home gym at his house East of Tilford. When Herrington and his wife moved far out of town, they decided to do their workouts at home. Choosing a room to function as a home gym or personal workout space is just as important as finding the right equipment. The key is to make the space inviting, experts say. Put the gym in an area that will keep you active, engaged and coming back for more. Do you like fitness videos, or Wii? Invest in a good, well-positioned TV, and an equally good sound system, so you can play what will motivate you to keep exercising. Have remote controls accessible for everything. 2. Cardio and heart rate: Portable fitness options and small accessories can help you go the extra mile. Eric Herman, fitness category manager for Boston-based CSN, likes Stamina’s elliptical trainer that’s compact, lightweight and stores easily under a desk or in a closet. They make folding treadmills and bikes, too. Tara likes the Bowflex/Nautilus Treadclimber. Gaiam has a fun mini-trampoline with a handle; it comes with a 35-minute workout DVD. And a few rounds in Wii Fit’s hula-hoop activity are effective, too. 3. Flexibility and balance: Resistance bands are an inexpensive, effective option for muscle toning. Balance balls work your core; Gaiam makes several. And for something different, consider Gaiam's T'ai Chi Fan Dance Kit; it includes a cloth fan and instructional DVD. atmosphere? Hang some mirrors and motivational images to inspire you. buy has an auto-stop safeguard. 20-by-20 feet - to a workout area. "People may splurge on an elliptical or a treadmill, and then a year later, they'll add more equipment as they've proven to themselves that they're serious about working out," notes Herman. Tara has done some large and elaborate home gyms, complete with remote lighting and sound, tilt-mounted TVs, climate control and a steam room. Fridges, ballet bars and color-matched equipment are often added. For a typical home, she advises putting the workout area "where you like to spend your time. Better to put it in a corner of the living room than in the bedroom - that's where you go to sleep." She also advises against ordering a complicated, multi-component piece from an infomercial. "Eight cartons show up with 3,000 pieces you have to put together. Once assembled, they're often too big for the space, too complicated and noisy." Try out equipment in fitness or sporting goods stores; read online reviews. If you're strapped for both cash and space, a mat, some weights and a couple of towels will do, says Tara. "Just get yourself moving. You don't need all the gizmos. There are 24-hour fitness channels on TV. Invite a friend over. The goal's to stave off boredom so you keep exercising." 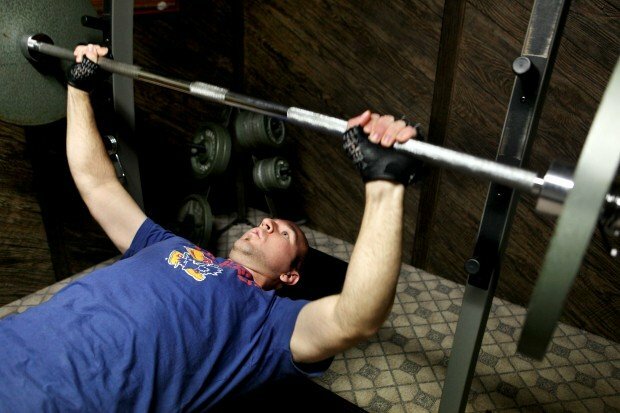 Setting up a home gym doesn't have to be expensive or expansive.